Errors can arise during a shop’s removal of the existing windshield, according to guest Mark Olson , CEO of Vehicle Collision Experts. “There’s just all kinds of issues with using an inductor,” Olson said, describing it as a good tool but not for glass. The device’s heat can also radiate to and affect nearby high-strength steel structures (which are heat-sensitive) foams, e-coat and adhesives, Olson said. He allowed that the inductors where a maximum temperature could be set by the repairer could be OK, but argued that instructions like using the device until the surface “‘smokes a little bit'” were too imprecise. The inductor, designed for applications like breaking paint bonds, will also eliminate the urethane bonding the glass to the car — a substance that should be allowed to remain, according to Olson. Olson said that “one of the things we see a lot” is the technician who removes the glass will “make it nice for the next guy.” The tech will scrape the pinchweld and leave as thin a layer of urethane as possible, he said. “You do not want your glass company doing that,” Olson said. Instead, the glass remover should cut as close to the glass as possible and “leave a big mound of urethane,” according to Olson. It’s desirable for urethane to stick to other urethane, he said. In general, about 3 mm of urethane left on the car is right, he said. Painters, for their part, should leave the substance alone and just tape over it during their prep, Olson said. Besides foregoing an inductor, the shop removing the glass should take care to remove the glass in a single continuous cut, according to Olson. Multiple cuts in the urethane can compromise the bond. And “the right thing” is to pick up the edge if a deep cut in the urethane does occur. Otherwise, urethane will cover the top of the cut and create leak, shear and safety issues, according to Olson. 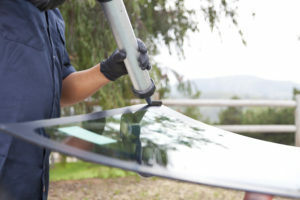 Whether you’re installing the new windshield yourself or outsourcing it, make sure the urethane applied is something required by the OEM, not just some “over-the-shelf” option, according to Olson. If the glass installer passes that test and uses an automotive-grade urethane, make sure it’s the right kind. The urethane required for an American car might differ from that demanded by a European OEM, Olson said. An aluminum car with electronics in the windshield might require nonconductive urethane or “the electronics in the windshield will talk to the car,” he said. A shop must also be mindful of the cure time and other considerations for a freshly installed windshield, according to Olson. Olson said that parking a vehicle unevenly can cause the car to twist enough that the windshield doesn’t set correctly, and the curing process can also be affected by time, humidity and temperature. Sometimes tape all around the windshield will seal the urethane too much — the substance needs moisture to cure, and it can’t get in, according to Olson. He also observed that washing one’s car after a glass installation was a good thing from a curing perspective. Glass is structural, and the shop doesn’t want to be left holding the liability for its failure, the broadcast cautioned. “Glass plays an impact role in collisions,” Collision Hub CEO Kristen Felder said. She noted that glass actually had multiple rules surrounding its installation, “but we still aren’t doing it right.” Olson referred shops to the Auto Glass Safety Council’s standard, which he said many insurers require to be followed anyway.